Yah! I have good news guys. I finally figured it out. The bad news is that I have no time to document it right now but I will later today. Check back in in a few hours from now! 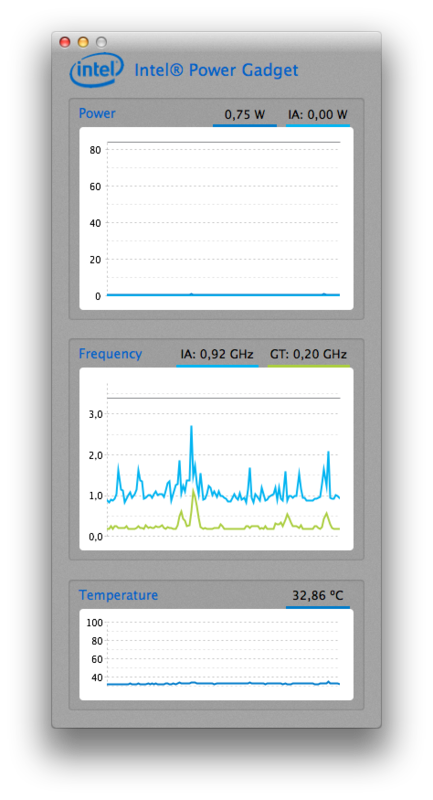 A new version of AppleIntelCPUPowerManagementInfo.kext (v3.4) will also be released later today. Oops. I forgot that I had a birthday party and thus I was unable to finish my work in time. Let’s try again next week. Giving me some slack to release a brand new script. One that people will need to debug stuff. Ok. I first need to update ssdtPRGen.sh to make it work for certain motherboards that use _HID set to ACPI0004 to declare the processor objects from a Device scope. Without this it fails to work on these motherboards. I’ll try to commit a new update a.s.a.p. Done. And no. Don’t you dare to ask what I did. I won’t reveal anything!!! Note: I also have other plug-ins in AppleHDA892.kext/Contents/PlugIns but that will be discussed in one of my next blog articles. Next. Here is a screenshot of the Intel Power Gadget (v3.0.1) running on my Haswell setup. Please note that the Mac-F60DEB81FF30ACF6 you see here will of course be different when you are using a different board-id. No worries. This will be checked by AppleGraphicsPowerManagement.sh Currently at version 0.6 but I will change/update it when required. Oh sure. I will add it to my Github repository, but at a later date. Edit: Done! Now available from my Github repository. p.s. Folks in need of different data could use this script after they modified it. Apple seeded a third test build of OS X 10.9.2 (13C39) to registered Mac developers, available through the Software Update mechanism in the Mac App Store as well as through the Mac Dev Center. Hmm. It may be me, but it doesn’t seem like a lot was changed. Only a hand full of kexts. Not even one that we are interested in. 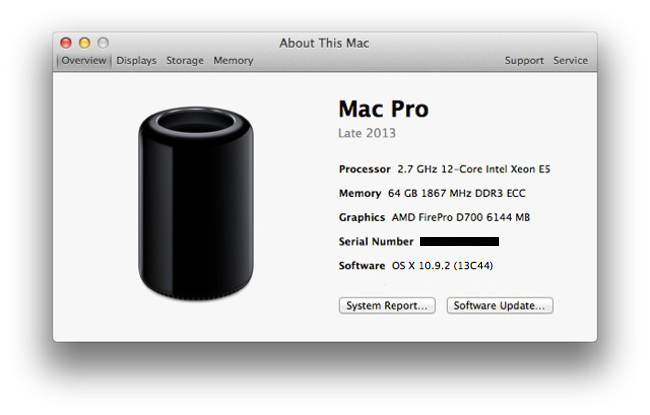 Seems like power management in Mavericks really changed. Again. At least one person (Hackmodford) on Github issues confirmed that this was the case. And to be absolutely 100% certain that this is the case… I made you a new update of ssdtPRGen.sh that I committed seconds ago. Note: The 0x8 is probably different for you! p.s. I don’t know when power management was changed. In which version, so we have to figure that out together. So far I have only have one confirmation that it works, with a i7-3770K, but I am working with Gringo Vermelho to see if we can get his configuration going. 1 – Injects one extra Turbo P-State at he top with max-Turbo frequency + 1 MHz. 2 – Injects N extra Turbo P-State at the bottom. 3 – Injects both of them. Get ssdtPRGen.sh version 9.0 now from Github repository, link below, and see if it is working for you. Thank you for testing this update! A month ago I published a first blog article about a New style of AppleHDA.kext patching and two weeks ago in a New style of AppleHDA.kext patching (take II) I started to get a lot more feedback and as a result we now have a much better script. One that really works. In this blog article, called a New style of AppleHDA.kext patching (take III) I would not only like to thank the people who helped me, like Toleda, but I would also like to ask all of you to give the next version a go – committed later today. I’d also like to stress that my days are slowly counting down so please, please report bugs and other possible suggestions to make the script even better. Link to Github issues was broken. Now fixed. Apple seeded a second test build of OS X 10.9.2 (13C39) to registered Mac developers, available through the Software Update mechanism in the Mac App Store as well as through the Mac Dev Center. 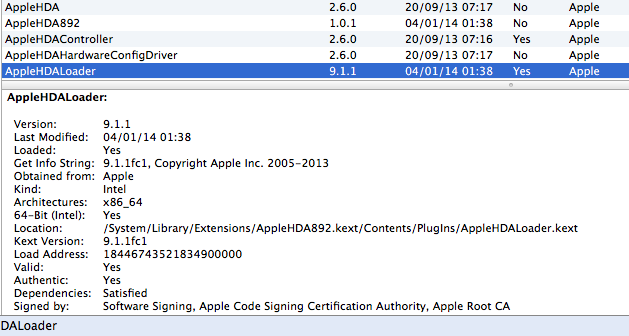 Don’t know what changed for hackintosh users, but this update appears to be fine so far.